On a sunny Saturday afternoon, Kim Min-jin, 24, visited a cafe in Samcheong-dong, a quaint neighborhood in Seoul tucked among tourist hot spots, to seek refuge from the bustle of the metropolitan city. As Kim and her friends started to chat over a cup of coffee, a mother turned up with three children at the posh premises and sat next to them, as the kids continued screaming, playing games and running around. The noisy, disruptive children eventually prompted them to move upstairs, leaving them to welcome the idea of child-free quiet zones. 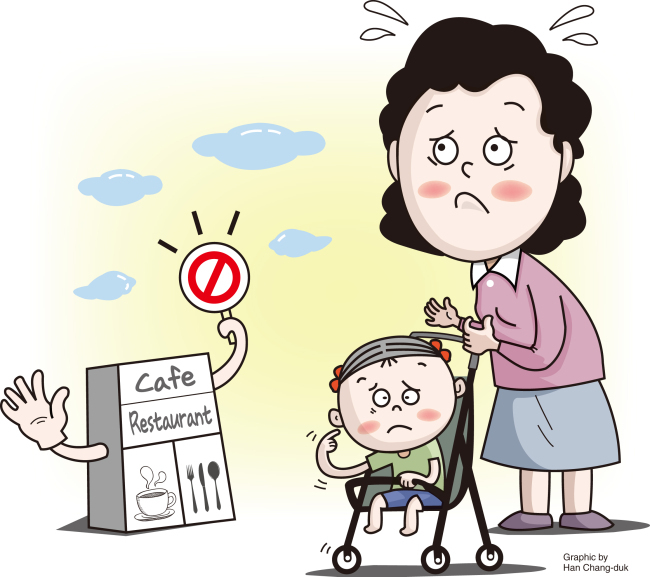 With screaming children becoming the bane of many restaurants, South Korea is seeing a growing number of child-free venues in recent years. Many of them impose an outright ban on children by putting up signs like “No children under age 7 allowed” on their doors. The emergence of child-free venues dates back a few years, when restaurants and cafes in the capital’s hip districts such as the Hongdae and Gangnam areas began to close doors to children, mostly due to growing complaints about noisy kids in the public space. Soon, the trend spread to other metropolitan cities. The cafe lost some customers, but gained a regular clientele. “Our cafe respects those without children who come to get their work done or relax,” she said. An owner of a top-notch restaurant in Cheongdam-dong, an affluent part of Seoul, said that it shut kids out for the sake of other customers paying large sums of money for an exclusive, romantic experience. Indeed, a poll by Albamon, an online part-time job recruitment site, on the staff members of eateries showed that 7 out of 10 of them were in favor of kid-free establishments. While the current Korean law does not stipulate regulations on businesses’ choice of selectively accepting customers, a series of past court decisions were deemed to have contributed to the growing number of kid-free venues. In 2013, the Busan Central District Court ruled that a restaurant owner and waiter should take 70 percent of the responsibility for a 10-year-old child, who had suffered a burn after the waiter bumped into the kid and spilled hot soup on him. They were ordered to pay 41 million won ($34,700). The ruling stoked debate, with some suggesting the child’s parents should also be held accountable for not looking after him. Now, the spreading no-kids zone is sparking further controversy, with some raising concerns about it egging societal aversion toward children, while others welcome the concept as an inevitable guideline not particularly against children, but their parents. “I am also a parent, but I see the need for kid-free venues as there is an increasing number of parents who disturb others in public by failing to properly discipline their children,” said Joo Hee-sun, a working mother of two aged 5 and 7 residing in Seoul. The 36-year-old mother said she could easily sympathize with others irritated by the sound of infant tantrums when dining in expensive restaurants. Kim Min-kyung, a 37-year-old mother of two children aged 2 and 6, also supported the concept of kid-free zones. “No-kid zones should be called more like a no-irresponsible parents zone,” Kim said, lashing out at ill-mannered parents turning a blind eye to their children’s misbehavior. “The self-centered parents do not seem to make enough efforts to teach their children how to behave in public, and they get often offended when others ask them to keep their kids quiet,” she said. The reason behind parents overly respecting their children, or “helicopter-parenting” them, is related to the chronically low birthrate with more parents having children less and later in their lives, an expert said. “With over-parenting becoming a common culture in society, people started to take matters into their own hands by supporting kid-free zones,” said Seol Dong-hoon, a sociology professor at Cheonbuk National University. “The problem of overprotection also stems from young parents lacking a chance to learn about traditional Korean manners and etiquette as they grew up in smaller, nuclear families,” he added. The phenomenon has even brewed an infamous moniker “Momchoong” on cyberspace, referring to the moms refusing to discipline the children in consideration of others. It is a combined word of mother and insect. The term is quite controversial not only because it disparages overprotective mothers but also because it doesn’t reflect the existence of mollycoddling fathers, the mother Kim Min-kyung noted. With such negative connotation more liberally being placed on children in general, some have also started to voice concerns about the impact. Rather than excluding children from the public life, businesses should become more kid-friendly to keep them from causing a scene, the 37-year-old working mother suggested. “For instance in the U.S., restaurants would offer my children a kit full of crayons and papers to keep them occupied and happy,” Kim said. Kwak Keum-joo, a psychology professor at Seoul National University, also pointed out that presence of kid-free zones segregating children is a reflection of society’s immaturity.